A Whole New Adventure: Field Trip! This post is long overdue. We had the wonderful experience of accompanying tenth grade students on a field trip in the beginning of the month. Maybe wonderful isn't the word that truly conveys the experience - unique, adventurous, confusing, spontaneous - take your pick. They all work. This field trip did not resemble any prior field trip that either of us had ever been on. There were three chaperons for about 26 students - the two of us and the music/tourism teacher Eduardo. I must admit though, that 26 is just an estimate. There was never an official headcount and when we arrived at our first stop Eduardo was asked how many people were in our busetta (little bus) and he looked around for about two seconds and said 30 with a shrug of the shoulders. The first stop was at a biological reserve called Tirimbina. It was amazing - nine kilometers of trails through the jungle, suspension bridges crossing the Sarapiquí River, sloths, snakes, frogs, bats - you name it. We were in heaven being outside after a long respite. We also had the pleasure of walking with a small group of students that seemed to spot every little critter that was hanging out near the beaten path. 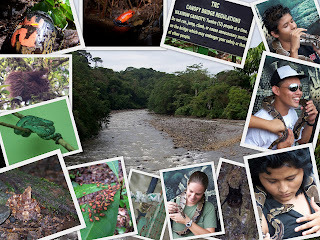 They pointed out giant beetles, huge ants, little frogs, bats, crazy looking insects, sloths and snakes. They took their time and photos of just about everything they came across, allowing us to catch up with them and take our own photos. Then we came to the harsh realization that while we think walking through the jungle is cool, tenth graders can only take so much of this coolness. We may have covered about five kilometers before they were begging for a break and to get out of our jungle surroundings. We sadly left the jungle, bringing up the rear, following the students as they made their way back across the suspension bridge that had given us a brief glimpse into the jungles of Costa Rica. The group convened at a small program shelter and started to make lunch. We had embarked on this journey somewhat unprepared - grabbing a loaf of raisin bread and some cheese empanadas from the grocery store on our way out of town. The students however quickly set up shop. Out came the loaves of bread, sandwich meat, cheese, tomatoes, mayo and ketchup. They got to work and made sandwiches that were better than ones brought from home - these were fresh and not squished or soggy after sitting in your backpack all morning long under the hot sun. Lesson learned. As they began cleaning up leftovers Eduardo posed the idea of going back into the jungle. This was not well received. Instead, the brilliant idea of taking a side trip to the nearby Serpentarium (Snake Garden) was put on the table and Eduardo excitedly called the owners up. He set to making a deal and got off of the phone asking students if they could put up mil colones (about $2) each to pay for our time looking at the snakes. Some people put in more than others to cover the cost of this unexpected adventure and Eduardo called back with the grand total (less than a mil per person) and permission was granted - by the Serpentarium owners that is; the school and parents were not contacted. Like I said, this was unlike any field trip we had ever been on before. Eduardo called the driver of the busetta who was unavailable at the time so the group decided it would be best to walk down the busy "highway" for 300 meters to get to our destination. With cars flying past we moved quickly down the road, searching for safety and the building with a giant snake painted on it's side. The owner met us upon our arrival, explained the rules of observation and let us in. We saw snakes that we had never seen before (perhaps as a result of import laws in the states) and heard the laughter and shrieks that the students let loose. The trip was brought to a close with the opportunity to hold a ball python. The experience just got stranger from there with the girls fighting over who would hold the snake first and the guys discretely moving to the back of the crowd. The snake was draped over shoulders, kissed and passed from one student to the next. Some of the girls squealed and timidly approached the snake, ultimately taking it in their hands long enough for a photo. Some of the guys called out for their mothers as the snake was placed in their hands but they ultimately struck rock star poses for the camera. With the snake growing restless and the busetta on its way it was time to pay for the trip. That's right, transportation wasn't paid for until the end. One student was put in charge of collecting the money (about $4 per person) and making a list of those who had paid. When the driver showed up the money was passed over and tucked away - no need to count the money, we're all honest here. As we started the trip home Eduardo turned around and asked for the permission slips. Good time to check on those, right! A trip like no other resulting in a whole list of dos and don'ts for when we're teachers leading our own students on field trips.